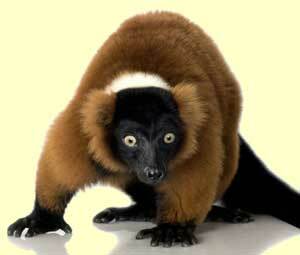 Lemurs are a kind of primates endemic to the island of Madagascar. Habitat, feeding, anatomy, social structure, reproduction, evolution, predators and all the information about lemurs. Lemur taxonomy has been a little bit controversial. The number of recognized lemur species has grown from 33 species and subspecies in 1994 to approximately 100 in 2008. Lemurs are considered by the International Union for Conservation of Nature (IUCN) considers lemurs to be the world’s most endangered mammals. Lemur Information, Anatomy, Feeding, Communication, Reproduction, Predators, and Conservation. The Lemur is the smallest of all primates and very few people even realize that they belong to this particular type of animal. Early evolution shows that they were once as large as an adult gorilla though. This is based on fossil remains that are millions of years old. The Lemur is believed to have gotten smaller in order to adapt to living in the trees and to rely on less food for survival. There are many different species of Lemurs and they can offer various sizes and colors. As a result they are often misidentified as some other type of creature. All of them except for one species have long tails. They use the tail for balance though and don’t hang by them as other primates do. All Lemurs have a long nose and they have four legs. They sit or they stand up but they always walk on all fours. They don’t walk upright as other primates have been known to do. They have thin fur due to the warm locations of where they live. They do have opposable thumbs like other primates. The Lemurs are mainly nocturnal animals but they can be active during the day as well. Most of them live in the trees from birth but some of the larger ones will spend time on land daily. They see very well at night but also rely on their sense of smell to help them get around and to recognize each other. The smallest species of Lemur weights about 10 grams. The word Lemur is Latin and means spirits of the night. The socialization for the Lemur is very interesting. They live in families of up to 15 members. Most of them consist of males, females, and offspring. However, there are some which are only females and young. The males have been driven out so they live alone or they form male only families. The females are the leaders of the Lemur families. They get to say who stays and who goes. The grooming process is part of the social order for each family. There tends to be quite strong bonds in these families. However, there are also plenty of conflicts over food and habitat among them. This can result in death if the fighting escalates. Lemurs eat fruits and nuts that they find in the trees or on the ground. They also consume small insects. Many of them have seasonal times of the year when they are able to find enough food. When there isn’t much food they will either slow down their metabolism or hibernate. They are the only type of primate that is known to hibernate. They can also shut down their need to mate when there is a shortage of food or shelter. The females have this natural ability as a survival mechanism. They are the only primates known to have this particular type of ability. There is a very short mating period annually of just a few weeks for Lemurs. The time of year varies based on the geographical location of the Lemurs. These young often have a mortality rate of over 50%. This is one of the reasons why it is hard to get their numbers to increase. All species of Lemurs are in grave danger at this time of being able to survive. Even though they only have two natural predators – the Fossa and the Harrier Hawk – humans have hunted them for a very long time. They have also drastically reduced the natural habitat by clearing out trees. There are some significant conservation efforts in place for them. Still, many worry that there isn’t enough being done. They want to see more land protected for the future of the Lemurs. In the wild they can typically live up to 18 years but in captivity they can live up to 30 years. That is why part of protecting them includes captivity programs with breeding being a primary part of the success of these programs.